Today's Wonderful Weekly giveaway is this gorgeous unmounted rubber stamp set from Innovative Stamp Creations called Harlequin Flowers. 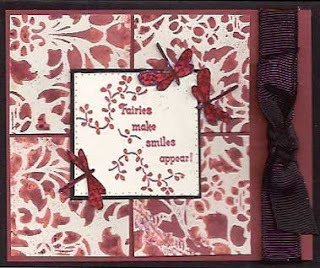 The card that was made with today's set also has a sneak peek of the Faux Vellum Technique -- one of the 15 new techniques that are in the upcoming April 2009 ; issue of the Technique Junkie Newsletter. The Harlequin flower was stamped and colored with this technique. You will be amazed and thrilled when you learn this easy and inexpensive manner of creating your own vellum! In any case, to enter this giveaway for the card and the stamp set, simply leave your name and a way for me to contact you in a comment below. I will be selecting a winner on Monday using a random number generator, so you have until 12 midnight on Sunday March 29th to enter. Good Luck! The winner of this giveaway is: Kathryn Doorbos -- congrats! Today's Giveaway is very special -- because we are celebrating with our long-time friend Kelley Holland as she celebrates the ONE YEAR ANNIVERSARY of Our Daily Bread Designs! We are giving away the stamp set above to celebrate, along with the card on the right. 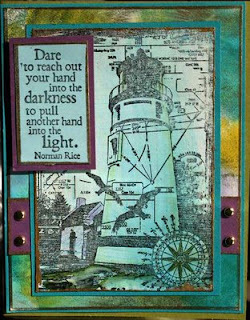 The card I made to honor this gorgeous set uses the lighthouse stamped directly on a piece of Oil Pastel Chic (from the December 2008 issue of the Technique Junkie Newsletter). I layered this piece over a piece of shimmering Silken Mist (from the October 2006 issue of the NL). You can celebrate with Our Daily Bread Designs further by joining the blog hop to win more blog candy and prizes! Visit Kelley's blog for more details. 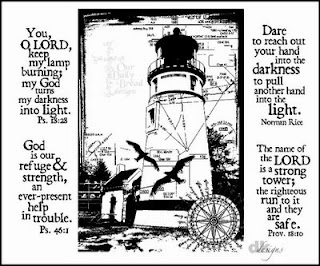 Oh -- ODBD has two new Special Editions with verses chosen from Kelley's design team -- visit the ODBD site to see them. And don't forget, Technique Junkies take 10% off by using the coupon code TJShop. To enter this giveaway, place a note in the comments section with your entry. Enter by 11:59pm EST on Sunday, March 22nd No other entry methods will be included in the give away. If you email me to enter, your entry will NOT be considered a valid entry. When you leave the comment, make sure to put your NAME in the comment -- if you enter your comment as "Anonymous" - or you just enter with your first name, I cannot give you the prize! Blogger does NOT record your email address for me, so you will need to check back to find out if you have won or include your email address in your comment so that I can notify you. A good way to do this is like so: phuntoon at optonline dot net -- it will help protect your privacy! I will have a random number generator pick one number from the comments to select one winner. Enter today -- good luck! The winner of this giveaway is Sheila Brelsford -- Congrats! This week's blogger's challenge is about texture. 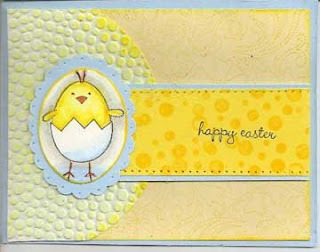 I am cheating a bit this week -- I made this card long ago and never used it -- but I like it nonetheless! The textured bumpy part is the Cuttlebug Smoosh technique from the October 2007 issue of the TJ Newsletter. The Chick was colored using the Marker Watercoloring technique (June 2008 TJNL). 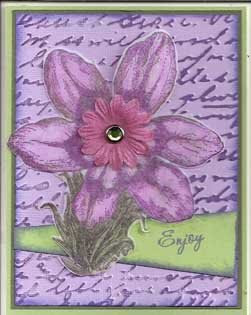 Wonderful Wednesday Giveaway - Clear Artistic Stamps! On Special this week at Clear Artistic Stamps are "That's My Boy" and "Tiny Button Baby". Get them both for only $19.95! Check out the What’s New& Specials Page and see 2 beautiful, quick cards using the Sympathy Garden set from the Capacious Collection. clearartisticstamps@belindalandtroop.com! Belinda will send an invoice to you through PayPal. To be the lucky winner of this giveaway, enter a note in the comments section with your entry -- and tell me why we should believe in fairies : ) Enter by 11:59pm EST on Sunday, March 15th. No other entry methods will be included in the give away. If you email me to enter, your entry will NOT be considered a valid entry. When you leave the comment, make sure to put your NAME in the comment -- if you enter your comment as "Anonymous" - or you just enter with your first name, I cannot give you the prize! Blogger does NOT record your email address for me, so you will need to check back to find out if you have won or include your email address in your comment so that I can notify you. A good way to do this is like so: phuntoon at optonline dot net -- it will help protect your privacy! I will have a random number generator pick one number from the comments to select one winner. Each give-away is separate, so to be eligible for a specific item you must enter that day's contest on the post where it is listed. Enter today -- good luck! The winner of this giveaway is Donna Thielker -- congrats! The winners of the Triple Play giveaway!! Triple Play Giveaway 3 & BC, too! Today's Triple Play Card (from the February 2009 issue of the Technique Junkie Newsletter) is a double play -- it is the third card in the series of three for the I Brake for Stamps Giveaway, and it is also my Blogger's Challenge Card for this week. 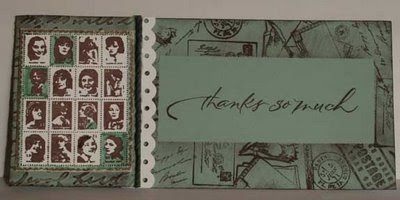 The challenge this week was to make a card using Sage Green and Brown (neutrals optional). What a beautiful combination these colors are! On the flap of this card, I chose to use the postoid ladies in a block, and highlight a few of them with my sage marker. I layered that on a sanded brown piece, and then cuttlebugged the flap and highlighted it with brown. I used a Fiskar's Scallop punch (yes, it has the holes already) on the white, and added a sage cord to cover the "seam." On the main part of the card, I used the Block Collage Technique (February issue of the TJ Newsletter). Alas, I am sad. I had NO theme music running through my head for this card. I have no witty repartee. No bad puns. Sorry about that! Although, this card just may be my favorite of the trio. something about it in person is really special. Let me know which of the three is YOUR favorite! And check out the splendid artwork from the other Blogger Challenge players --click on the link on my sidebar for a complete list of the participants. Triple Play Giveaway - Day 2! As promised in yesterday's giveaway post, here is the second Triple Play Card (Technique from the February 2009 issue of the TJ Newsletter) for the Giveaway from I Brake for Stamps. The details on the giveaway are HERE in cased you missed them, but basically, you can enter this giveaway three times -- yesterday, today and tomorrow -- for three chances to win. Enter once per day for the three days, one post per day. I had originally intended on using the "Audrey" image for this post -- but since I just used her a week ago on THIS post, I decided to highlight this image. I just have to tell you that it is a little tongue-in-cheek that the "happy days" phrase was paired with the waist/corset image. The days when my waist was that small were happy ones indeed (oh wait, never mind -- now I am wiser, smarter, and happier - probably because I can eat LOL). I also kept thinking about the collective female population: What were they THINKING to wear those ridiculous corsets! Silly girls. The things we do for fashion! Ah yes, no 19" waist here -- but at least I can eat pasta. Don't forget to enter the giveaway on this post today by entering a comment on this post. I hope you didn't think that my corset commentary was too restricting, crossed the line or was even a waste (yes, puns intended - ouch). Triple Play Giveaway -- Three ways to win! Today's Giveaway is a Triple Play! So why will you have three chances to win? Because this is a Triple Play. The card above uses teh stamps with the Triple Play Technique (from the February 2009 issue of the TJ Newsletter). If you are a TJ Subscriber, you know that you yield three cards when doing this technique...so for today, tomorrow and Friday, I will be posting the three Triple Play cards. YOU can post an entry EACH DAY to win the stamps. More details about this are below. And someone will win the stamp set, someone the cards -- and I may even send one lucky winner a free year of the newsletter (details below). About my card: As I was making this card, the theme to the movie "9 to 5" by Dolly Parton keep running through my mind -- along with visions of Rosie the Riveter and Sally Field as factory worker. The main image I used for the card just reminds me of the working women during world-War II -- something that brings to mind the power of women overall. You may not get my obscure reference, but it makes sense to me! Here is a message from Della from I Brake for Stamps -- some great deals to go along with today's giveaway! We have some brand new Humorous Seniors. Some are on motorcycles, some are jogging and some are getting married. They are a riot! The new CATS from Stampinback have also been released.Be sure to click on the thumbnails to see some card samples. We also have some selected rubber sheets and singles that are discounted up to 30% off. Please click here http://tinyurl.com/5kcsq3 to view those items. Some stamps are very limited and will be removed once they sell out. TJ members can receive an extra 10% off by using the secret code (TJ10) during checkout. Shipping will be a flat fee of $4.85 for all purchases for U.S.residents. International orders are welcome, but please contact me for shipping rates. Please use the secure shopping cart to place your orders. We accept Visa, MasterCard and Paypal. You can enter this giveaway three times -- once per day, on three different posts. You may enter once on the Wednesday, March 4th post (on this post), Thursday, March 5th (on tomorrow's post) and on the post for Friday, March 6th. On Monday, March 9th, I will combine the posts and use the random number generator to select THREE winners. The first winner will receive the stamp set and their choice of the three cards -- the second and third winners will receive the other two cards. Here is a bonus -- if the combined comments total more than 1000, I will give the second place winner a free year of the newsletter!! So if you want the free year -- tell your friends to enter, too -- it will increase the number of posts! To enter, leave me your name or email address in the comment section. If you are a TJ member, you can leave me your first initial, last name and state (p huntoon CT) or your email address: (p huntoon at optonline dot net). If you leave an anonymous post -- or just your first name, you will not be eligible to win (blogger does NOT leave me email addresses). So you have three chances to win -- enter each day! Good luck! And more than one anonymous. If I have an anonymous post that wins, I simply have the random number generator pick a new number. Since you enter, I assume you want to win, right? So give me a hand -- tell me who you are. Even if you are registered with blogger, THEY DO NOT SEND ME YOUR EMAIL address. That keeps computer bots away from spamming you -- plus, I remove the comments at the end of the giveaway to protect you more. So please, I beg you -- tell me who you are!! !